Just off the coast of Maine lies Acadia National Park, home of several charming small towns, and the carriage road network of off-road trails that were built by the Rockefellers for the purpose of wowing their guests with natural splendor. It still works. With a stately park serving as your gateway out of the city, the LF1 bike path eventually runs you through the natural area of the dunes along the North Sea. The bike path is first-rate (of course... look where you are), the beach is just over the stairways that traverse the dunes, and plenty of paths cut inland, should you choose to head to a small town for food. The Hague's Scheveningse Bosjes is a park providing a grand entrance to the Dunes. Over 340 miles of car free path that takes you gently downhill from urban Pittsburgh, through Pennsylvania's wooded interior to urban Washington D.C. in quiet bliss. Bike from Pittsburgh to DC completely off road on the Great Allegheny Passage. Historic bridges along the Great Allegheny Passage. 13 miles of car-free riding along the beach, under palm trees, with plenty of food and drink options at your disposal. Bay Shore Bikeway is accessible via a bike friendly ferry. Minneapolis has miles of "bike highways" making side by side riding easy peasy. Former grain mill rail lines that have since been converted to intra-city greenways connect most everything to most everything else here, meaning you can easily bike together to a great meal, a microbrewery, and then home, all with minimal on-street riding. Free cultural bike map and "2.5 Days to Wander" travel guide. 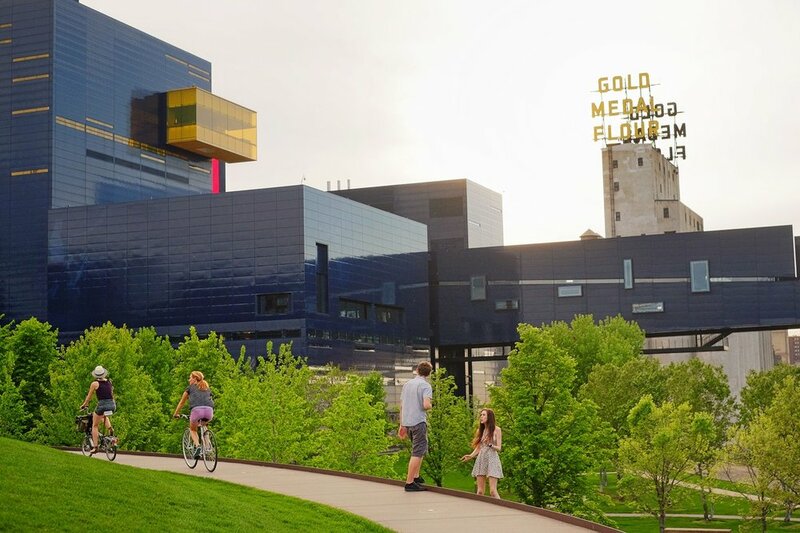 Green spaces and interesting architecture galore as biking eye candy in Minneapolis. Beginning in the northeast of Paris, this path follows the Ourcq River for 67 miles out of town, taking you past Paris's industrial and suburban outskirts and into the quiet woods along the canal. America's first rail-trail project, and still one of the best, this trail features easy grades, quaint towns, and three cool, dark stone train tunnels - the longest of which is over 3/4 of a mile long. Over 3,000 miles of bike paths traverse Quebec, including Montreal and Quebec City. Everything is here - the mountains, farms, woods, and cities that are cultural gems in their own right. Quebec City is one of the most beautiful cities in the world. Quiet back roads and an extensive bus network that has bike racks makes it much easier to cover Sonoma Valley by bike than most realize. The scenery is golden and perfect in a way that few places outside California can compete with, and the refreshing pit stops are world-class. Probably the most popular bike path in all of Europe, and for good reason. It connects Passau in Germany with Vienna, with the downhill direction (towards Austria) being the overwhelmingly popular direction. Probably the most scenic of all the routes we've listed.